The 10th Industrial Fluid Properties Simulation Challenge will test the capability of molecular dynamics simulation to provide the property of liquids most important to elastohydrodynamic lubrication (EHL), the pressure-viscosity relation. The temperature dependence at elevated pressure could be the subject of a future challenge. A fundamental requirement of elastohydrodynamic lubrication (EHL) is a description of the viscosity of the liquid as a function of pressure . The classical film thickness formulas all require a value for a property known as a pressure-viscosity coefficient; although the definition of this property is not always clear . The shape of a traction (friction) curve has been the subject of much speculation for at least forty years . The shape of a traction curve when plotted as friction coefficient or average shear stress versus the logarithm of sliding speed or slide-to-roll ratio depends strongly on the pressure dependence of viscosity at the Hertz pressure , more fragile liquids having a less steep logarithmic portion. Although the pressure dependence of viscosity is clearly essential to the field, until about ten years ago, experimentally measured values of this property were not a typical part of EHL analysis. The reasons for the previous neglect may be debated, but the demand for this information is now growing. Molecular dynamics simulations have the promise of generating pressure-viscosity data for liquids which have not yet been synthesized but only if the accuracy of the method can be validated. There has been a claim of success in predicting the pressure dependence of viscosity for squalane , although the temperature dependence is not accurately recovered in this example . There has been extensive experimental work on squalane viscosity at elevated pressure [7,8] so that simulations have a known “target” value of viscosity. As of this time, there has been no success in recovering the super-Arrhenius pressure dependence that is important to friction . A Lubricant Viscosity Simulation Challenge is now proposed to assess the possibility of employing molecular dynamics simulations to predict the pressure dependence of viscosity in a simple hydrocarbon molecule. This should be a material for which there is no presently published viscosity data, with the exception perhaps of viscosity at ambient pressure. It should, for simulation convenience, be composed of a minimum number of carbons. Linear alkanes are excluded because they are not glass-formers and would be crystallized at EHL pressures. The material should possess all of the pressure-viscosity trends of lubricating oil. A candidate fulfilling these requirements is 2,2,4 Trimethylhexane. 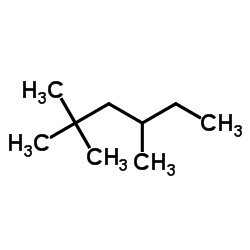 Prof. Scott Bair (Georgia Tech) has characterized the viscosity of 2,2,4 Trimethylhexane (>98%), Aldrich product number 92470, lot BCBR3588V. The viscometers were calibrated with di (2ethylhexyl) sebacate based on the correlation of Paredes et al. . Estimated uncertainties are 3% for viscosity, 0.3°C for temperature and the greater of 1MPa and 0.4% for pressure. Entrants are challenged to predict the viscosity at pressures of 0.1, 25, 50, 100, 150, 250, 400, 500, 600, 700, 800, 900, and 1000 MPa, all at temperature of 20°C (293K). Entries will be judged based on comparison to the benchmark data at those state conditions and to the pressure viscosity coefficient. Any theory/modeling/simulation method can be used as long as it is generally accepted to be a “molecular modeling” approach. For example, strictly empirical correlation will not be considered for the challenge. This is in keeping with the focus and goals of the IFPSC to benchmark and promote molecular modeling and simulation methods. If you are unsure whether or not your method is considered to be “molecular modeling” by the challenge organizers, please ask in advance. Any force field (or other model parameterization) previously published in the open literature prior to the announcement of this challenge is acceptable. Force fields (or other models) that have not been published previously may not be parameterized for this challenge using viscosity data for the same molecule at any pressure above atmospheric. Force fields (or other models) may be parameterized using any other published physical property data. Estimates of the uncertainty for the predicted properties must be included. A submission for this challenge problem is to be in the form of a manuscript suitable for submission to a refereed, archival, scientific journal. The manuscript must contain sufficient detail about the simulation or other method and about the force field (if simulation) so that an experienced simulator could reproduce the results without requiring access to proprietary information. In particular, all potential parameters and molecule geometry parameters must be explicitly specified in the manuscript. An analysis of the uncertainty in the calculated results is required and must be included in the manuscript. Entries are expected to present results that are statistically significant and to present sufficient supporting evidence to establish this quality. Also, the scientific reasoning behind any new (unpublished) force field parameterizations must be clearly spelled out in the entry. If there is a consensus among the judges that an entry is of poor quality (uses a method commonly accepted to be fundamentally flawed, presents results that are not statistically significant, fails to provide sufficient supporting data and details, violates the various rules and guidelines established for the competition, or for any other reason would be unlikely to be accepted by any peer-reviewed scientific journal in the field), that entry will be rejected and will not be considered in the judging. Entries that represent collaborations between multiple research groups are welcomed. 1. Dowson, D., & Higginson, G. R. (1966). Elasto-hydrodynamic lubrication: the fundamentals of roller and gear lubrication. Pergamon Press. 2. Bair, S., Liu, Y., & Wang, Q. J. (2006). The pressure-viscosity coefficient for Newtonian EHL film thickness with general piezoviscous response. Journal of tribology, 128(3), 624-631. 3. Johnson, K. L., & Tevaarwerk, J. L. (1977, August). Shear behaviour of elastohydrodynamic oil films. Proceedings of the Royal Society of London A: Mathematical, Physical and Engineering Sciences Vol. 356, No. 1685, pp. 215-236. 4. Bair, S., Martinie, L., & Vergne, P. (2016). Classical EHL versus quantitative EHL: a perspective part II—super-Arrhenius piezoviscosity, an essential component of elastohydrodynamic friction missing from classical EHL. Tribology Letters, 63(3), 37. 5. Jadhao, V., & Robbins, M. O. (2017). Probing large viscosities in glass-formers with nonequilibrium simulations. Proceedings of the National Academy of Sciences, 201705978. 7. Comuñas, M. J., Paredes, X., Gaciño, F. M., Fernández, J., Bazile, J. P., Boned, C., Daridon, J.L., Galliero, G., Pauly, J. & Harris, K. R. (2014). Viscosity measurements for squalane at high pressures to 350MPa from T=(293.15 to 363.15) K. The Journal of Chemical Thermodynamics, 69, 201-208. 8. Bair, S. (2006). Reference liquids for quantitative elastohydrodynamics: selection and rheological characterization. Tribology Letters, 22(2), 197-206. 9. Bair, S., Martinie, L., & Vergne, P. (2016). Classical EHL versus quantitative EHL: a perspective part II—super-Arrhenius piezoviscosity, an essential component of elastohydrodynamic friction missing from classical EHL. Tribology Letters, 63(3), 37. 10. Paredes, X., Fandiño, O., Pensado, A. S., Comuñas, M. J., & Fernández, J. (2012). Experimental density and viscosity measurements of di (2ethylhexyl) sebacate at high pressure. The Journal of Chemical Thermodynamics, 44(1), 38-43.